Cluster analysis is often referred to as supervised classification because it attempts to predict group or class membership for a specific categorical response variable. Clustering, on the other hand, is referred to as unsupervised classification because it identifies groups or classes within the data based on all the input variables. These groups, or clusters, are assigned numbers. However, the cluster number cannot be used to evaluate the proximity between clusters. Self-organizing maps attempt to create clusters and plot the resulting clusters on a map so that cluster proximity can be evaluated graphically. This example does not contain a self-organizing map. However, the SOM/Kohonen node is used to create self-organizing maps. This example uses the same diagram workspace that you created in Chapter 2. You have the option to create a new diagram for this example, but instructions to do so are not provided in this example. First, you need to add the SAMPSIO.DMABASE data source to project. In the Project Panel, right-click Data Sources and click Create Data Source. In the Data Source Wizard — Metadata Source window, click Next. In the Data Source Wizard — Select a SAS Table and enter SAMPSIO.DMABASE in the Table field. Click Next. In the Data Source Wizard — Table Information window, click Next. In the Data Source Wizard — Metadata Advisor Options window, select Advanced. Click Next. For the variable NAME, set the Role to ID. For the variables TEAM, POSITION, LEAGUE, DIVISION, and SALARY set the Role to Rejected. Ensure that all other variables have a Role of Input. In the Data Source Wizard — Create Sample window, click Next. In the Data Source Wizard — Data Source Attributes window, click Next. In the Data Source Wizard — Summary window, click Finish. This creates the All: Baseball Data data source in your Project Panel. Drag the All: Baseball Data data source to your diagram workspace. 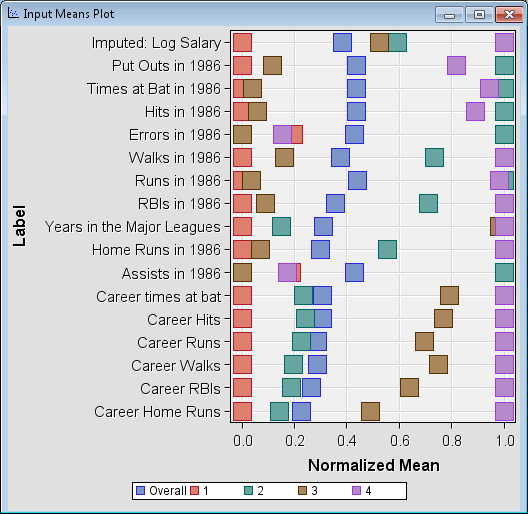 If you explore the data in the All: Baseball Data data source, you will notice that SALARY and LOGSALAR have missing values. Although it is not always necessary to impute missing values, at times the amount of missing data can prevent the Cluster node from obtaining a solution. The Cluster node needs some complete observations in order to generate the initial clusters. When the amount of missing data is too extreme, use the Replacement or Impute node to handle the missing values. This example uses imputation to replace missing values with the median. On the Modify tab, drag an Impute node to your diagram workspace. Connect the All: Baseball Data data source to the Impute node. In the Interval Variables property subgroup, set the value of the Default Input Method property to Median. On the Explore tab, drag a Cluster node to your diagram workspace. Connect the Impute node to the Cluster node. By default, the Cluster node uses the Cubic Clustering Criterion (CCC) to approximate the number of clusters. The node first makes a preliminary clustering pass, beginning with the number of clusters that is specified in the Preliminary Maximum value in the Selection Criterion properties. After the preliminary pass completes, the multivariate means of the clusters are used as inputs for a second pass that uses agglomerative, hierarchical algorithms to combine and reduce the number of clusters. Then, the smallest number of clusters that meets all four of the following criteria is selected. The number of clusters must be greater than or equal to the number that is specified as the Minimum value in the Selection Criterion properties. The number of clusters must have cubic clustering criterion statistic values that are greater than the CCC Cutoff that is specified in the Selection Criterion properties. The number of clusters must be less than or equal to the Final Maximum value. A peak in the number of clusters exists. Note: If the data to be clustered is such that the four criteria are not met, then the number of clusters is set to the first local peak. In this event, the following warning is displayed in the Cluster node log: WARNING: The number of clusters selected based on the CCC values may not be valid. Please refer to the documentation of the Cubic Clustering Criterion. There are no number of clusters matching the specified minimum and maximum number of clusters. The number of clusters will be set to the first local peak. After the number of clusters is determined, a final pass runs to produce the final clustering for the Automatic setting. You are now ready to cluster the input data. Right-click the Cluster node and click Run. In the Confirmation window, click Yes. Click Results in the Run Status window. 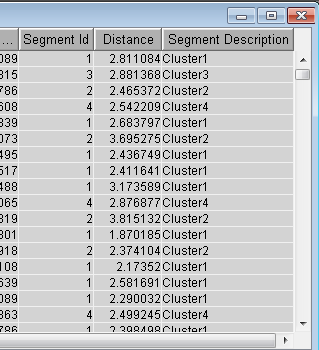 Notice in the Segment Size window that the Cluster node created 4 clusters. On the main menu, select View Cluster Profile Variable Importance. The Variable Importance window displays each variable that was used to generate the clusters and their relative importance. Notice that NO_ASSTS, NO_ERROR, and NO_OUTS have an Importance of 0. These variables were not used by the Cluster node when the final clusters were created. 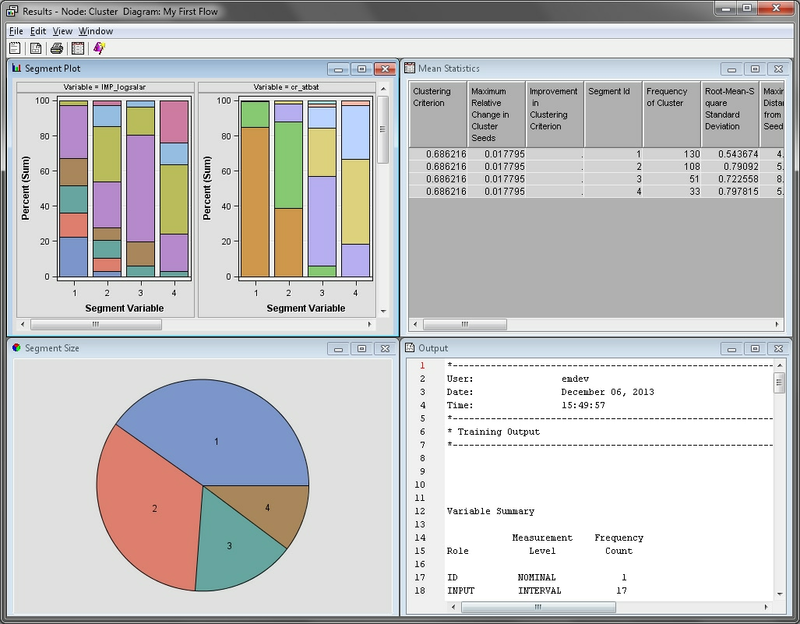 On the main menu, select View Summary Statistics Input Means Plot. This plot displays the normalized mean value for each variable, both inside each cluster and for the complete data set. Notice that the in-cluster mean for cluster 1 is always less than the overall mean. But, in cluster 4, the in-cluster mean is almost always greater than the overall mean. Clusters 2 and 3 each contain some in-cluster means below the overall mean and some in-cluster means above the overall mean. From the Input Means Plot, you can infer that the players in cluster 1 are younger players that are earning a below average salary. Their 1986 and career statistics are also below average. Conversely, the players in cluster 4 are veteran players with above average 1986 and career statistics. These players receive an above average salary. The players in clusters 2 and 3 excel in some areas, but perform poorly in others. Their average salaries are slightly above average. Select the Cluster node in your process flow diagram. Click the ellipsis button next to the Exported Data property. The Exported Data — Cluster window appears. Click TRAIN and click Explore. The Clus_TRAIN window contains the entire input data set and three additional columns that are appended to the end. Scroll to the right end of the window to locate the Segment ID, Distance, and Segment Description columns. The Segment ID and Segment Description columns display what cluster each observation belongs to. 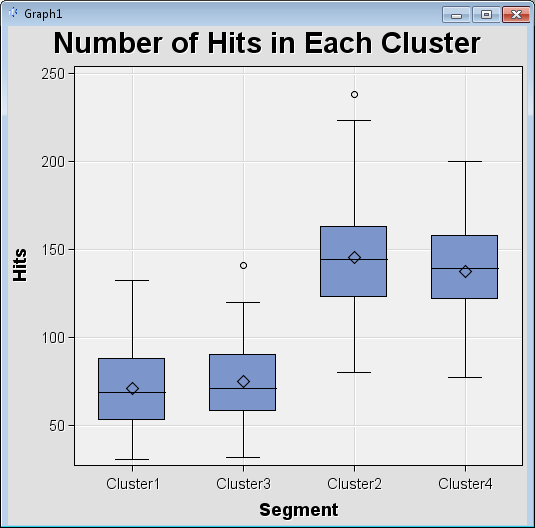 Next, create a plot that compares the number of hits for each cluster. On the main menu, select Actions Plot. In the Select Chart Roles window, find the _SEGMENT_LABEL_ variable. Set the Role for _SEGMENT_LABEL_ to X. Next, find the NO_HITS variable. Set the Role for NO_HITS to Y. Click Next. In the Data WHERE Clause window, click Next. In the Chart Titles window, enter Number of Hits in Each Cluster in the Title field. Leave the Footnote field blank. Enter Segment for the X Axis Label. Enter Hits for the Y Axis Label. Click Next. In the Chart Legends window, click Finish. Notice that the average number of hits in clusters 1 and 3 is significantly lower than the average number of hits in clusters 2 and 4. You should repeat these steps to create box plots for several other variables.